Mindset is a funny thing. It’s not something that we commonly think much about throughout the day, if at all. But it is so very powerful in being that bridge from what we want in our life to what is our life. Without the proper mindset, fears and obstacles could not be overcome, and goals never met. 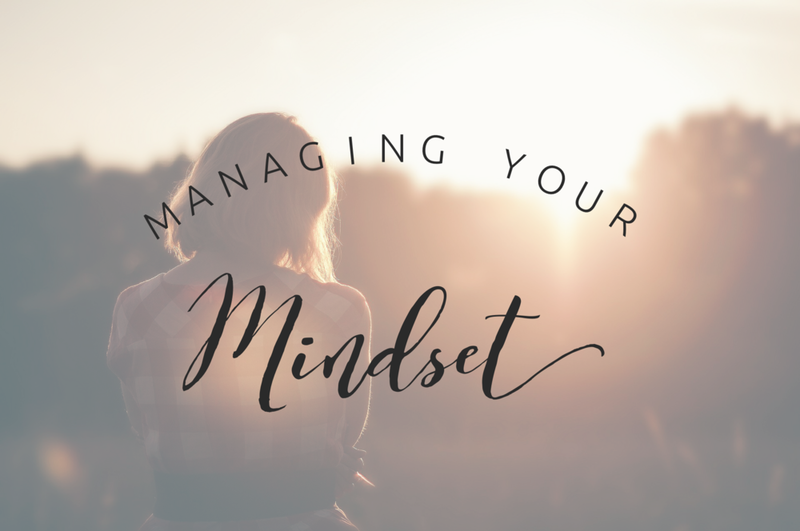 In fact, my mindset is something I have been consciously working on changing for the past several weeks and I can attest to the fact that it has been far more difficult than I could have imagined. However, when it comes to essential oils, I have found that it has been a treasure trove of experiences and resources in the process. So, before we get too far ahead of ourselves, let me offer a couple mindset tips for those new to essential oils first. We get a lot of questions about where to start when a member of our tribe finally gets a starter kit from Young Living. It’s overwhelming, that shiny new box full of these beautiful little bottles. And the information thrown around is just astounding, I mean look at that guide book on essential oils, it could be used as a doorstop! We get it, we were there once too. But before you make the mistake that so many do and tuck it away thinking this isn’t something you can do, stop and address your mindset. You can do this with two simple mindset-changing steps. 1. Go put your bottles where you can see them. Get them out of that starter box, out of your drawers. They want to be out hanging with you, just like you don’t put baby in the corner, don’t do it with your oils. Out of sight means out of mind, and we can't have that when we're creating a new habit. To aspire to a more holistic, healthful lifestyle, we're going to need some consistent usage, which means pretty bottles on your nightstand, bathroom counter, kitchen counter, and in your purse. 2. You don't have to get it all perfect or understand everything yet. I know it seems scary, but it doesn’t have to be. Break some rules, it feels good I promise. One of the best pieces of advice I have ever received was from an art professor in college. She warned us never to hesitate at the canvas, don’t worry if what you are doing is perfect, get it dirty, get it messy. So, get your canvas dirty, dive in and open the bottle and smell it. Yep, that simple. That tiny act sends all kinds of messages to the command center of your brain telling it beautiful and affirming things. Just like the smell of a rose or honeysuckle can make you feel happy or send you back to a sweet memory or time in your life, your oils are created and designed to tell your body "You can do this. I'm here to support you." Plus, there are so many calming, focusing, and respiratory benefits to the oils that come from breathing them in. They too raise your frequency. All living things have frequency and the higher it is, the healthier that living thing is. As it lowers, disease can begin to invade. Let's raise those frequencies. 3. Use them. And if you are unsure which ones to begin with, here are three to give you a great jumping off point. Does as it says… brings love and joy to the heart. I wear it as perfume and it has so many emotional benefits. Joy has 10 different oils in its blend including rose, so it’s frequency is impressively high. This is a gem, providing spiritual support and it has ten therapeutic grade oils in it. Labeled the power and protection of angels, it increases your aura around the body and creates a feeling of wholeness. It also does a fabulous job of protecting you from negative energies. An all-time favorite oil for sure! This one helps to balance spiritual, physical, emotional energies on the body. The smell is quite heavenly. They also call this liquid courage, so I use this one in many of our public events. This is an important oil used in the raindrop technique and in the feelings kit along with some other great feelings oils like harmony, forgiveness, inner child, release and present time. With all we have been putting into starting up Serendipitous Living, mindset has been something all three of us have be very aware of and talking a great deal about. In fact, it is a subject we will most definitely be talking about again in upcoming blogs. Until then, get that canvas dirty!